Most automotive engineers are familiar with mechanical and electrical vehicle design and testing requirements, but fewer will also know about all the EMC design and testing requirements for conventional, hybrid and electric vehicles. Boris Sedacca reports. Text: Automotive companies use their own requirements over and above those published in standards to avoid the threat of liability. In-house requirements are typically 10 times higher than the EU Automotive requirements, often interpreted as absolute minimum requirements. As long as the in-house requirements are met, legislative requirements are just a formality for automotive manufacturers. EMC design is not just about shielding sources of electromagnetic emissions. Keith Armstrong, principal at EMC specialist Cherry Clough Consultants argues that EMC shielding is costly and adds unnecessary weight when other measures are available by using robust circuit and software techniques. “The result of interference is a delayed, degraded or false signal,” says Armstrong. “If interference causes a vehicle fieldbus not to recognise a data packet and it has to be transmitted again, this could be hazardous in safety circuits such as braking. There are hardware and software signal and power integrity techniques listed as good practice in the IEC 61508 international industry standard for functional safety. “A vehicle electromagnetic environment is very harsh because of electrical activity such as DC motors, sparking plugs and pulses that feeds a fuel injection system. Electric vehicles also produce a good deal of interference from pulse width modulation (PWM) motor drives as a series of continuous spikes and transients. Armstrong holds that improved vehicle fuel economy has also been achieved by electronic means in other vehicle constituent parts, like suspension yaw and pitch control or stability control by modulating the braking and acceleration of different wheels when cornering for example. In electric vehicles, the power drive usually runs on a high voltage battery of cells connected in series to produce a PWM output of 400-700V, whereas everything else typically runs off a conventional 12V battery. Higher voltage produces the same power at lower current in order to reduce cable size to save on cost and weight. From a product liability point of view, there is a legal requirement for auto makers to apply stringent tests according to ISO 11451 Part 2 and CISPR 12 and 25 specifications, but according to Carl Wayland, EMC technical and quality manager at the Motor Industries Research Association (MIRA), they will often exceed these requirements with additional tests devised in house. “The standards call for testing of surges, voltage dips and interruptions, particularly for to grid where you need to make sure you are not putting harmonics into the network,” Wayland clarifies. “When an electric vehicle is charging, there must also be no radio interference, so it depends on how well the PWM inverter is suppressed, the shielding techniques used and how much engineering has been put into it all. “We are talking of high current at high voltage, so what gives off EMC emissions is given by the change in voltage, or dv/dt, in a signal to drive a motor. You need expensive test equipment like receivers, signal generators, amplifiers and transient generators to replicate high voltage transients which occur in the environment and surges to simulate electrical strikes, as well as voltage dips and variations on power mains. Wayland cautions against over-engineering in vehicle design without paying attention to the subsequent test regime this will incur. EMC can be modelled on a desktop computer but until the vehicle is actually in a chamber with RF being directed at it and RF being emitted from it, the position of units and modules means that millimetres can make a significant difference in terms of results. 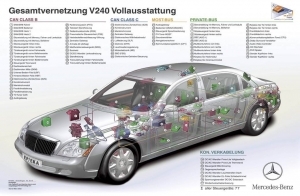 Auto makers therefore ensure that component suppliers test their subsystems at a high level. EMC design therefore needs to be integrated into silicon, the first part of the vehicle supply chain. Mart Coenen, chief executive officer at EMCMCC in Eindhoven, The Netherlands, is involved with integrated circuit (IC) development, pre-qualification and characterisation for linking to various vehicle sensors like temperature, pressure and fuel flow. Between the ICs and their sensors, the interface may range from simple analogue to sophisticated digital fieldbus protocols. “Most sensors nowadays are provided with four connection methods in parallel, which may be programmed at the foundry or at the assembly stage by the auto maker,” reveals Coenen. “Welded steel parts are becoming less common today and are being replaced by carbon fibre parts fastened with epoxy, as in the aerospace industry for example, where the wings of an Airbus are glued to the body. This makes them more transparent to electromagnetic interference. “The bus interfaces and supply voltages are already defined so whatever is done in silicon is up to the IC manufacturer. I work with three of them and depending on the foundry, and in most cases they are mixed signal devices, of which the major part is digital nowadays. I carry out circuit simulations and 3D electromagnetic solving for them but the topology used by auto makers in the wiring harness is undefined, so you can only simulate up to the device terminals. Coenen discloses that the Vauxhall Ampera for example has 30kg of cable shielding. Electric vehicle charging stations may output power at 100kW in order to reduce charging time to around ten minutes, which in itself is twice as long as petrol refuelling, whereas domestic charging from mains may take anything from six to ten hours. 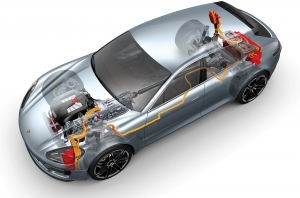 German auto makers have recently founded a work council for development and testing of electric vehicles, tabling an amendment to CISPR 25 which includes tests for radiated emissions on a vehicle battery, converter and electric motor, as well as components. “You have to think about impedance not only at the battery terminals but also at the terminations for the high voltage lines and communications lines,” explains Ralf Benecke, electric vehicle EMC expert at Intertek in Germany. “Within CISPR 25 there are five tests for measuring attenuation for both high and low voltage systems because you have to ensure that disturbances from the high voltage system are not propagating through the low voltage system into the rest of the car. A normal scan will monitor a bandwidth of 30-100MHz, but when there are high voltage pulses on the electrical network they need to be tested using high bandwidth test equipment from the likes of Rohde & Schwarz and Agilent to ensure that components will be able to withstand such pulses. The test requirements will be defined in the functional performance specification by the auto maker, the customer and component manufacturer. Renault’s EMC unit at Aubevoye in France was built in 2006 to keep pace with the use of electronics in vehicle safety systems, such as ABS and emergency brake assist, ESP (Electronic Stability Programme) and airbags, as well as hands-free kits and satellite navigation. The goals are to ensure the immunity of vehicles to electromagnetic interference from external sources, to control electromagnetic emissions from vehicles and to measure the radiation performance of radio aerials. A team of 30 researchers, engineers and technicians is involved in EMC/RF activities. A vehicle in traffic is constantly exposed to electromagnetic fields from sources such as mobile phone transmissions, broadcasting transmitters and radar equipment. Regardless of the power or frequency of the field, it must not interfere in any way with the operation of the vehicle. The EMC engineers use the immunity test cage to measure the resistance to interference of the vehicle and its equipment with the aid of four antennas that expose the vehicle to electromagnetic radiation over a wide range of powers and frequencies. The 1,800 square metre building houses three Faraday chambers grouped around a remote control room, with each room designed to be impervious to electromagnetic interference from external sources. The radio frequency test chamber is dedicated to testing the radiation performance of radio aerials. Incorporating a 12-metre diameter arch comprised of 132 high-frequency and low-frequency sensors, the chamber enables 3D radiation diagrams to be produced in two hours compared with about two days for 2D patterns. In the immunity test chamber, the electromagnetic resistance of the vehicle is tested under extreme conditions. 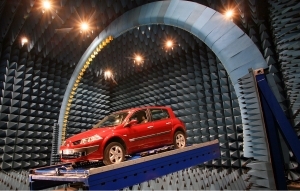 Placed on a roller test bed simulating actual running conditions, the vehicle is exposed to electromagnetic fields from antennas generating over 100 V/m at frequencies from 100 kHz to 3 GHz. European regulations specify a resistance of 30 V/m, which is much higher than the values encountered in the traffic environment. 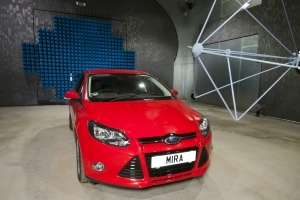 Conversely, the quietness (emissions) test chamber enables the electromagnetic emissions from the vehicle and its electronic equipment to be measured while excluding external radiation. Fig. 1. The Porsche Panamera is designed to be driven in pure electric mode by default up to a speed of 130km/h. Fig. 2. 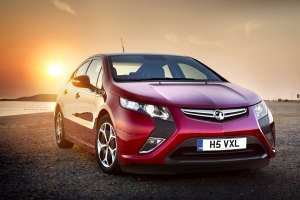 The Vauxhall Ampera has 30kg of cable shielding to counter electromagnetic interference. Fig. 3. Modern cars have a multitude of communications busses which are at risk from electromagnetic interference.